The general premise of CNN’s “Anderson Cooper 360” is that the program gives the viewer the entire picture of the stories being reported on. However, in the case of a segment with Nir Rosen, who sent some inappropriate tweets on the sexual assault of CBS reporter Lara Logan in Egypt, the story became a little cloudy. The story about Rosen was relatively straightforward, and Cooper was very tough on his guest. What made the segment interesting was the photo that CNN chose to use. 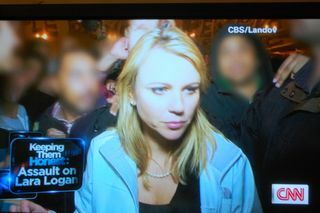 CBS had distributed a picture of Logan that was said to have been taken just before she was attacked, and clearly showed demonstrators around her. However, the CNN version of the very same photo had all the demonstrator faces blurred. As far as I know, it was the only instance of this photo being doctored in this fashion. But why did CNN do this? Were they worried about some anti-Arab sentiment if they showed the faces of the demonstrators? At that point they were just faceless names in the crowd, so it couldn’t have been a legal issue. CNN has been struggling with a network makeover, claiming that it will report the news in an unbiased manner- giving viewers more news and less opinion than its main competitors, FOX and MSNBC. However, in this case CNN has clearly expressed a bias by altering the picture. The network may have altered the opinions of its viewers by not giving them the full story. Just like Nir Rosen, who resigned after his tweets on Logan were brought to light, CNN should fire the person responsible for doctoring the photo and show the public that it won’t tolerate these type of shenanigans.